Gottman Method Training: Level 3 and Certification on Monday and Level 2 Training on Wednesday, today we turn our attention to Level 3 Training and Certification. After a discussion of Level 1 Training on Monday and Level 2 Training on Wednesday, today we turn our attention to Level 3 Training and Certification. Participants in the Level 3 Practicum Training, together with Drs. Julie and John Gottman, examine actual videotaped cases of couples brought in by workshop colleagues. The Gottmans use these videotaped cases as teaching and learning tools to help deepen understanding of when and how to use various Gottman Method approaches and interventions, and how to break destructive patterns and replace them with meaningful interactions. During this workshop, Drs. John and Julie Gottman lead discussions, demonstrate techniques and provide guidance in developing a road map for clinical decisions. 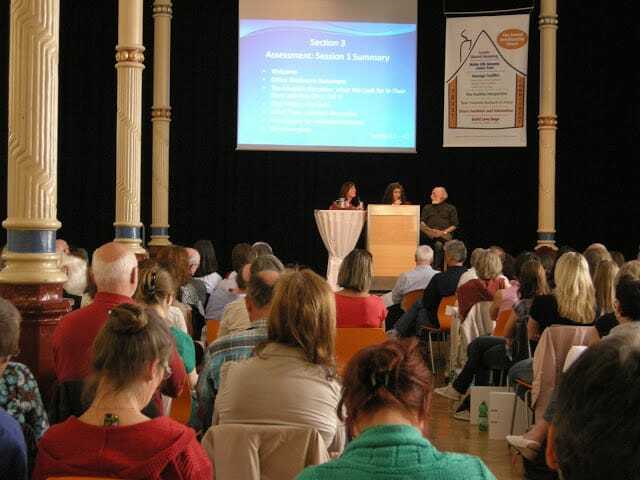 Participants have the opportunity to practice and refine their use of Gottman Couples Therapy through participation in role-plays, demonstrations and discussions in a small group setting, and receive personalized guidance and supportive coaching from the Gottmans and Senior Certified Gottman Therapists. After each role-play session, Dr. Julie Gottman will lead discussions that include case consultations and nuanced details of the techniques previously demonstrated and provides guidance in developing a roadmap for clinical decisions. Participants are asked to bring a short, ten minute or so, video segment (on DVD or USB thumb drive) of difficult and challenging couples to the Level 3 workshop. Drs. John and Julie Gottman will describe how they would treat these couples and then participants from the audience will volunteer to role play these couples with Drs. John and Julie Gottman demonstrating using a variety of interventions with these couples. Participants will then have the opportunity to practice using these interventions in a supportive small group setting with other participants’ role playing the couples from the videos. Acceptance into the certification track will begin the consultation process that leads toward certification. We strongly encourage you to enter the certification track right after completing Level 3, but you mustbegin consultation within 2 years of completing Level 3 training. You will have 2 years from entering the certification track to submit your videos for final review. Clinicians in the Certification Track will be matched individually or in small groups with a Gottman Consultant. Licensure, certification in a mental health-related field (in the state or province in which you practice) or equivalent. Your consultant will help you follow couples through the entire assessment and treatment process including selecting and implementing appropriate treatment interventions. This will involve guidance in performing core Gottman Method interventions for building friendship and regulating conflict including the Four Horsemen, Dreams Within Conflict, Compromise, Flooding and many others as dictated by clients’ unique needs and co-morbidities. The consultant will provide feedback on tapes of your interventions with clients in a supportive and encouraging manner. We recommend that you begin videotaping early in the process and expect that you will submit a minimum of three to six segments for feedback prior to certification review. The final step in qualifying for certification involves submitting and receiving approval on four specified videotaped segments of your clinical work. The purpose of submitting these tapes is for you to demonstrate your knowledge, appropriate usage, and comfort with four core Gottman methods. Because The Gottman Institute wishes to certify clinicians who can represent the Gottman Method sensitively and appropriately, trained Video Reviewers who are Senior Certified Gottman Therapists and Consultants will review these tapes to assess your readiness for certification. At the time of your review, you will be given feedback on your work from your consultant, and you will be accepted for certification or requested to take some action to demonstrate proficiency in an aspect that may need strengthening. If you are accepted, you will receive an oral summary of your review and a Certificate indicating that you’ve achieved designation as a Certified Gottman Therapist. (Please note: you will learn more about the consultation options at the Level 3 workshop. If you have questions about this process before attending the Level 3 Workshop, please do not hesitiate to ask). Membership in the new Gottman Referral Network (GRN) is now open to therapists who have completed Level 2 or Level 3, as well as Certified Gottman Therapists. Our Referral Network is the primary resource for couples worldwide who are seeking a Certified Gottman Therapist. Over the years, our original group of 16 Certified Gottman Therapists has expanded and now includes 160 therapists who contribute their talents, skills and experience to our mission of helping couples, families and children. In addition to a listing in the Provider Directory, Referral Network members have access to a number of professional development opportunities and receive numerous benefits and discounts. To join the Gottman Referral Network, contact training@gottman.com.